Get on up and dance your way into one of my favorite months of the year, FEBRUARY! February holds a special place in my heart for many reasons. Of course this being Black History Month is one of the top reasons. I’m ready for all of the Black Boy Joy and Black Girl Magic that is in store. This month is also my birthday month #TeamAquarius. Brandi’s Diary officially became a blog in February. To celebrate all things For The Culture, I will be highlighting some of my favorite bloggers. Be sure to put a bookmark on this page, pin it, or do whatever you have to do to remember to come back so you don’t miss out. Allow me to introduce you to a few of my favorite bloggers…. Chicago is one of those places that we automatically associate with the ultimate taste experiences in our country. If you want to be in the know on the best black and brown owned businesses in the windy city, then you have got to get connected to Aaron of Seasoned and Blessed. Learn more about Aaron here. When I tell you this man literally knows everybody in Dallas I mean it (well maybe some slight exaggeration lol but he’s certainly in with some highly important people). Nikia is passionate about putting Dallas on the map for great food and culture. You must be following him if you want to stay in the know and be connected to someone that will keep you entertained as well. He also just happens to be born on the best day ever! Meet my birthday twin here. Karissa is ultimate vacation goals. If you love to travel or are interested in what it’s like to take some solo trips you’ve got to check her out. She also host weekly live conversations that are entertaining and insightful. Learn more about her here. Apollo is showing the world that OKC has more to offer than just basketball. His work in the community has helped black businesses connect with the community around them and helped the people to discover places they otherwise would have never known about. His happy hours and brunches are something special. Check out more about him here and be on the lookout for upcoming partnerships between Dallas and OKC. If only my high school had a culinary program when I was in school Donevera is the person I’d want to be teaching those classes. Her students are lucky to have her, and her recent pizza class project had me rolling. Learn more about this chef, teacher and foodie here. Kimberly Stephens is the type of person you instantly become friends with. She has such a sweet spirit and she’s one of the most encouraging people that I know. She recently did a take over of Visit Plano and creates some of the most beautiful IG stories. Learn more about Kimberly here. Houston being my home away from home and Brunch being my favorite meal of the week, it was just natural that I became instantly drawn to the Black Girls Who Brunch account. Erika is your girl to put you on to the food scene in Houston. She’s also in the Black Blogger Clique with Renia of Gristle & Gossip. Learn more about Erika here. Renia is a Houston based Food blogger and one of the bloggers behind the Houston BLACK BINGO game. Following her is sure to keep you thoroughly entertained. Her sense of humor and realness are what make her one of my favorite bloggers. Learn more here. There is a whole black beer culture out there that I knew nothing about until meeting the man behind The Dallas Beer Squad. I’m not talking about Bud Light or Dos Equis either. I’m talking about true craft beer that would make even the biggest beer hater (like myself) find a beer they actually like. Learn more here. Scotty of Cook Drank Eat has a way of capturing your attention through his cooking videos. They tell a story and leave a bit of mystery at the same time. 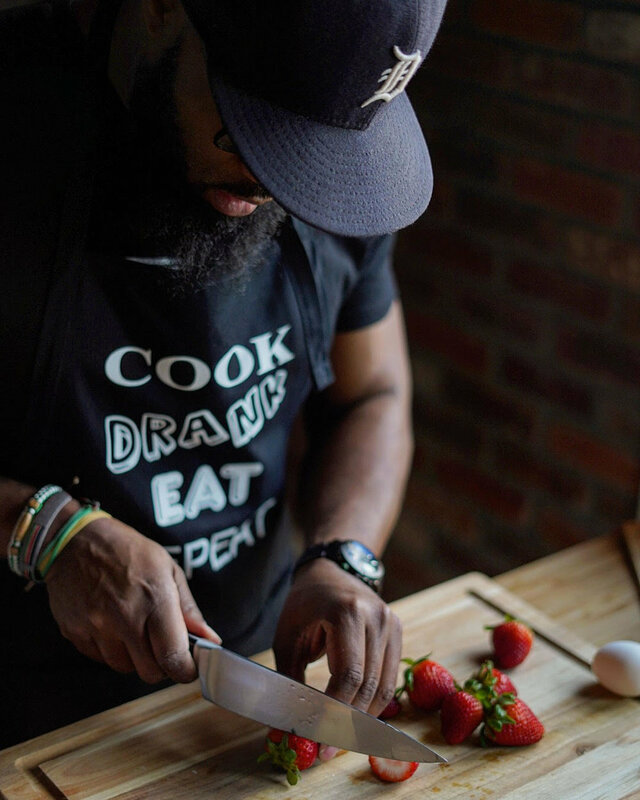 Learn more about the man behind Cook Drank Eat here. Dalila of Starving on a Budget is making a big impact on the DFW scene. The things she is passionate about doing for the black community are things I’m passionate about as well. She has created a table that didn’t exist years ago for Black Owned Businesses to have a platform equal to their counterparts. Check her out here.